A strawberry in Esther's little hands. This past week was strawberry week. Of course, it also was dance recital and hubby’s birthday week, but this post is about strawberries. Every year the children and I travel off the mountain to the nearest strawberry patch and pick and pick and pick and pick WAY more berries than anyone should have to deal with in a week. However, because the pickin’ place is an hour away, we can only go once a season and we overdo it. This year was no exception. We came home with 20 gallons of berries – especially ripe ones – so ripe they needed to be frozen or refrigerated that very day. The children and I rinsed, capped and drop- froze 12 gallons and refrigerated 8. Two shortcakes, a recipe of jam, 24 muffins and three breakfasts of Wheaties and berries later, we realized we needed to freeze the remaining berries in the fridge. With Daniel’s family coming for the recital, I looked around for a yummy dessert recipe and found one in one of my favorite books. 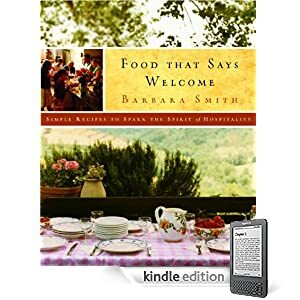 This cookbook, Food That Says Welcome, is authored by Michael W. Smith’s mother, Barbara Smith. It was given to me several years ago by my sister-in-law and I just love it. While I’ve not tried everything in it, most everything I have tried has turned out beautifully. Not only that, but most of the recipes Barbara uses take less than 30 minutes to prepare. No, it’s not the healthiest cookbook, but it’s full of crowd- pleasing, yummy recipes and sometimes that is just what I need… like last week with my last 2 gallons of very ripe berries in my fridge. Mix 1 stick of cream cheese with 1/2 cup of sugar. Add 12 ounces of Cool Whip. Mix well. Fold in 4 cups chopped, fresh strawberries. Pour evenly into two Oreo pie crusts. Freeze. Before serving, set out about 40 minutes to thaw a bit. Altogether (three families), we picked 50 gallons! This entry was posted on Sunday, May 29th, 2011 at 11:50 pm	and is filed under Recipes. You can follow any responses to this entry through the RSS 2.0 feed. You can leave a response, or trackback from your own site. I did not realize how color coordinated everyone was until I saw your photo!